Bloomberg endorses Obama, cites climate change: Hurricane Sandy's silver lining. 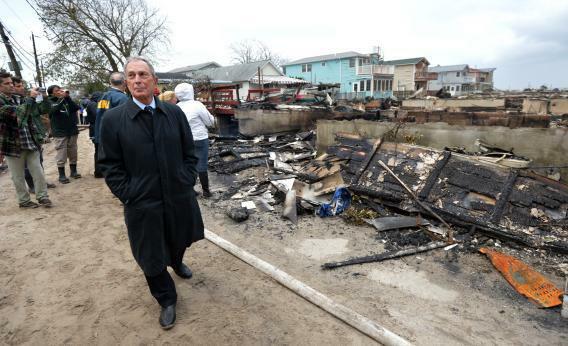 New York City Mayor Michael Bloomberg surveys the damage in Queens after fire destroyed about 80 homes as a result of Hurricane Sandy. If scientists are right about the implications of human-caused climate change, almost every intelligent person will, sooner or later, undergo a eureka moment in which the magnitude of the problem sinks in. For some cerebral types, reading an IPCC report or watching Al Gore drone on over a series of glorified PowerPoint slides may have been sufficient. For others, it will take a more personal blow. For Michael Bloomberg, it seems, that moment was Hurricane Sandy. The New York City mayor, whose backing Barack Obama and Mitt Romney have both sought, announced today that he was endorsing Obama. His No. 1 reason: the president’s stance on climate change. The devastation that Hurricane Sandy brought to New York City and much of the Northeast—in lost lives, lost homes and lost business—brought the stakes of Tuesday’s presidential election into sharp relief. The floods and fires that swept through our city left a path of destruction that will require years of recovery and rebuilding work. And in the short term, our subway system remains partially shut down, and many city residents and businesses still have no power. In just 14 months, two hurricanes have forced us to evacuate neighborhoods—something our city government had never done before. If this is a trend, it is simply not sustainable. Our climate is changing. And while the increase in extreme weather we have experienced in New York City and around the world may or may not be the result of it, the risk that it might be—given this week’s devastation—should compel all elected leaders to take immediate action. Bloomberg, whose business-friendly, tech-savvy, socially tolerant policies have made him one of the nation’s most influential centrists, is not new to the climate change bandwagon. But it seems that being forced to watch powerlessly as a freak storm brought his city to its knees prompted him to up the urgency a bit. The Washington Post’s Ezra Klein argued in an astute series of tweets that Bloomberg is “not endorsing Obama so much as he’s trying to reset the incentives on climate change.” There may be truth to that. As the Post’s Brad Plumer points out, Obama’s White House “certainly hasn’t made climate change a top priority over the past four years—it’s taken a backseat to health care, the economy, and financial regulations.” And while he made some nice noises about the issue in an interview with MTV last week, I couldn’t help but notice that he was rather short on substantive policy proposals. Yet for all that, I don’t read Bloomberg’s endorsement primarily as an opportunistic or strategic act, as Klein seems to. Call me naive, but I read it as a genuine call to action from a man who has just been brought face-to-face with one of the most serious threats to the nation’s long-term security and prosperity. Obama might not be a climate-change savior, but at least he doesn’t sneer at sea-level rise. Some might find it silly for Bloomberg to base his endorsement so heavily on a singular weather event. As I explained earlier this week, climate models don’t necessarily predict more hurricanes for New York in particular. Still, most scientists agree that Sandy was the general sort of havoc that we should expect climate change to wreak: freakish, unprecedented, and especially destructive because it hit a region that was not accustomed to such weather. Besides, it’s human nature to be influenced more by a visceral personal experience than by abstract prediction models or studies published in journals. Especially when it comes to climate change, polls suggest that many Americans engage in what cognitive scientists call motivated reasoning. When there’s a drought or a heat wave, belief in global warming goes up. But when the economy is in the tank, the truth gets a little more inconvenient, and belief in climate change subsides. Hurricane Sandy was a terrible event, but its timing might just be a silver lining. If it persuades smart independents like Bloomberg to cast their lot with the party that takes climate change seriously, the nation and the world will be better off for it.